The play “Allegiance” is scheduled to open in San Diego on Sept. 19. The producers of the play have received criticism about a pre-opening version of the play and they may make some changes before opening. However, we understand that they do not intend to change the play’s characterization of the Japanese American Citizens League (JACL), Mike Masaoka, who was national JACL secretary at the time Executive Order 9066 was issued, and the Nisei soldiers. Thus, in our opinion, the play’s plot is objectionable in that it misleads the American public and is a disservice to the Japanese American community. The comments in this letter are based on a review of a pre-opening version of the play. The play tells how two groups showed their loyalty to the United States during World War II. In telling their stories, the play pits those who volunteered to serve in the 442nd Regimental Combat Team against the “resisters” (aka “no-no boys” and draft resisters). The play also implies that JACL and Masaoka colluded with the government in shaping various governmental policies. These policies related to the forced evacuation of persons of Japanese ancestry, Question 27 and Question 28 in the loyalty questionnaire, segregation of “resisters” in Tule Lake WRA camp, and misleading Japanese Americans into volunteering for military service. Moreover, the play makes no mention of the actions of President Franklin D. Roosevelt, who signed Executive Order 9066, and Lt. Gen. John DeWitt, who implemented Executive Order 9066. These actions were later found to be the result of “prejudice, war hysteria, and lack of political leadership.” Rather, the play would mislead the American public by attributing unsubstantiated actions to Japanese American leaders who were attempting to bring reason to absolute chaos confronting the community. Furthermore, there is no question that there was an angry division in 1943 within the Japanese American community between those who volunteered to serve and “resisters” on the matter of loyalty. The play attempts to make the case that the “resisters” made the right choice and that those who volunteered were deceived by Masaoka and made the wrong choice. By fueling this controversy, the play attempts to reopen old wounds and does a disservice to both groups. Both choices were difficult and had permanent, life-altering consequences. In hindsight, both groups should recognize that there was more than one way to show one’s loyalty. Neither choice was the right one or the wrong one. Today, we should celebrate both groups for following their convictions rather than fueling this hostility by continuing to pit these two groups against each other. Finally, the play uses fictional characters except for Mike Masaoka. 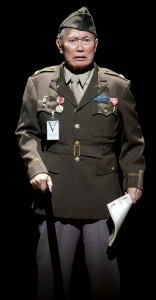 The play assaults his good name and reputation by alleging his direct involvement in shaping the government’s controversial policies. Let us hope that the play’s producers and investors can substantiate their apparent character assassination of Masaoka.